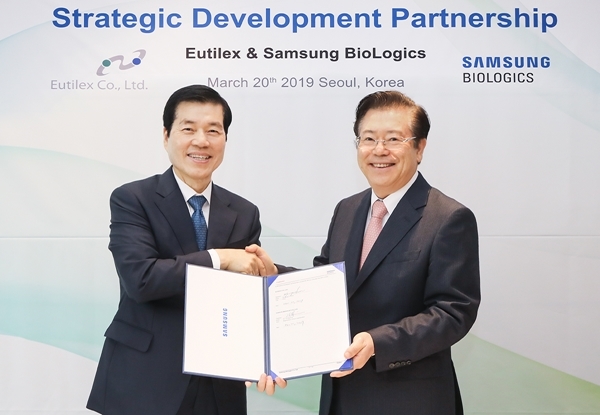 Samsung BioLogics said Wednesday that it has signed a contract development organization (CDO) agreement with Eutilex to cooperate on developing anti-cancer immunotherapies. Samsung BioLogics CEO Kim Tae-han (right) and Eutilex CEO Kwon Byeong-se shake hands after signing a CDO agreement at the Conrad Hotel in Yeouido, Seoul, Wednesday. “Samsung BioLogics, which has the world's best CDO technology, and Eutilex, which has a competitive candidate, are expected to speed up the development of the new drug,” Samsung BioLogics said. The CDO business is a service developing new drugs under contract and typically involves producing cell lines for clients' candidate drugs under development while establishing the mass-production process and manufacturing of phase I clinical materials. As many small biomedicine firms rely on contract development and manufacturing organizations (CDMOs) for their development and manufacturing needs, the CDO market has proliferated at an average rate of 15 percent a year. Given that most CDO businesses transition to contract manufacturing organization (CMO) businesses, companies are taking CDOs more seriously. Under the accord, Samsung BioLogics will provide its CDO service for up to 15 candidate immuno-chemotherapeutic agents developed by Eutilex from the development of cell lines to the production of phase I substances for the next five years. Founded by Kwon Byeong-se, a world-renowned immunologist, in 2015, Eutilex, entered the KOSDAQ market in December last year as a biotechnology company for immune-cancer therapy. The company holds a full range of pipeline drugs from antibody treatment to T cell therapy treatment and chimeric antigen receptor (CAR) t-cell therapy treatment drugs. To accelerate the pace of its commercialization efforts, it has undertaken many non-clinical and clinical studies concurrently. Most notably, the company possesses several first-in-class and best-in-class new antibody drug pipelines, based on its knowledge-based antibody platform. The company will spare no effort in helping domestic bio start-ups such as Eutilex move to the global market and commercialize their products quickly, Kim added.